Sample 1: A simple COBOL CICS Web Application that uses the CICSPlex SM API and the Dojo Toolkit to demonstrate how easy it is to display graphical data right out of your mainframe. This program is initiated in CICS from a Web Browser. It collects information from CICSPlex SM and builds a web document that gets sent back to the browser. The program demonstrates how simple it is to use the Dojo Toolkit along with CICS to produce graphical displays in the web browser. Program Source (DTK0001H): Click HERE. The program does little in the way of error checking and will need to be customised to the needs of your site. 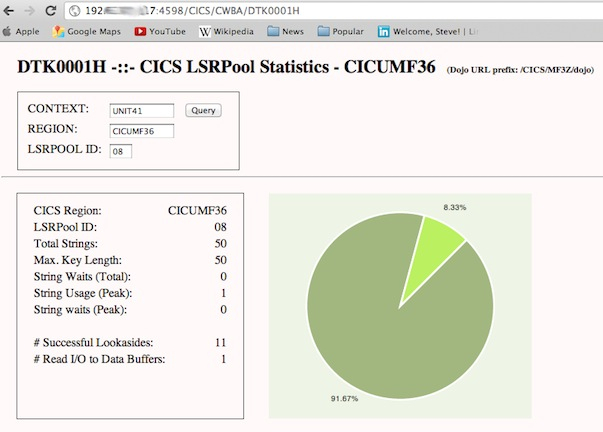 As can be seen, there is a Web Form at the bottom of the web document into which the user can type the name of a CICSPlex (Context), the name of a CICS Region (Scope) and an LSRPOOL number (for example ‘01′. Entering these details and Clicking the submit button causes the program to be re-driven and CICS will then collect the web form data entered and attempt to fetch CICSPlex SM data based on the input. The data fetched from CPSM is used within a Dojo Toolkit created Pie Chart that is re-created in the web browser. Sample 2: A simple COBOL CICS Web Application that displays a table of application data. This demonstrates how easy it is to us a Dojox DataGrid – right out of CICS on your mainframe. This program is initiated in CICS from a Web Browser. 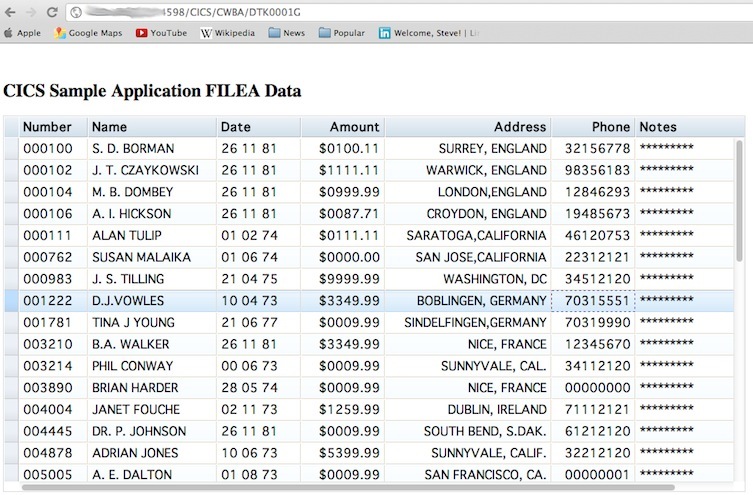 It runs a program that puts application data into a Dojo Dojox DataGrid (a table with rows of data). The DataGrid has a number of implicit features: column sorting; column resizing; row highlighting; scrolling, for example). The application data in this case is extracted from the FILEA VSAM file supplied along with CICS. Program Source (DTK0001G): Click HERE. The program does little in the way of error checking and may need to be customised to the needs of your site. As can be seen, it is very easy to call the Dojo from your mainframe and use the Dojox DataGrid to format rows of application data.